Stronger employment growth, lower unemployment claims, improved stock market returns, and lower gasoline prices helped boost a sharp rise in consumer expectations, pushing the overall Consumer Confidence Index to 70.3 in September and marking the highest reading in seven months. Despite tepid wage and income growth, consumers are saving less, but spending cautiously. 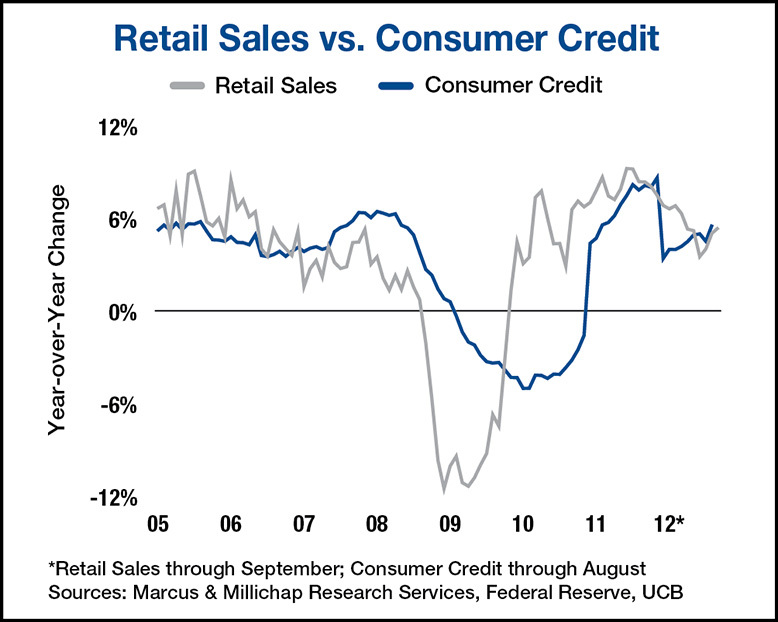 Electronics and appliance stores, non-store retailers and autos contributed to the strong lift in September’s retail sales, even as a pullback in gasoline prices slowed the pace of growth in gasoline sales. September retail and food sales totaled $412.9 billion, representing a 1.1 percent monthly increase over upwardly revised August sales, and a 5.4 percent increase above year-ago levels. Electronics and appliance stores led all retail components in relative monthly sales growth, increasing 4.5 percent in September. A recovering housing market was a major contributor to the sales increase in these big-ticket items. Another major gain was made in auto sales, which jumped 9.3 percent year over year as dealerships offered discounts to clear inventory of 2012 models. Non-store retailers, meanwhile, maintained the blistering pace of growth as consumers bargain shop due to the relatively slow pace of the economic recovery. Low interest rates continue to stimulate borrowing as reflected by consumer purchases of big ticket items such as autos, home appliances and housing. The Federal Reserve reported an $18.1 billion dollar rise in consumer credit in August, largely driven by non-revolving credit lines for student and auto loans, but overwhelmingly represents an increase in student loans. However, revolving credit, primarily representing credit card use, also climbed by $4.2 billion, the first increase in three months. August sales of existing homes rose 9.3 percent on an annualized basis, to 4.8 million units, which will further contribute to retail sales growth across multiple trade segments. However, elevated energy prices, along with higher wholesale food prices anticipated as a result of drought conditions, will pressure consumers’ discretionary purchasing power through the end of the year. Business inventories expanded broadly in August and included additions from manufacturers, retailers and wholesalers, which could bode well for industrial properties. However, this may be somewhat short-lived as slowing global economic growth was manifest in the loss of momentum in manufacturing orders and U.S. exports, and even imports (net of price increases), in recent months. Net absorption is still forecast for a healthy 100 to 125 million square feet this year quickly absorbing the 45 million square feet delivered. Vacancy could decline another 50 to 90 basis points to 11.0 percent. Tightened fundamentals in supply-constrained coastal and distribution hub markets could prompt rent growth exceeding 4.5 percent, while nationally effective rent growth should range between 3.5 and 4.5 percent. The deferral of significant decisions until post-election and resolution of “fiscal cliff” issues reduces the likelihood of any wholesale roll-out of new retail stores. A slow recovery in retail sector fundamentals continues, but the emphasis on downsizing to compact formats, trends in upgrading existing stores and mobile retailing technologies implies fewer near-term space requirements. Net absorption of nearly 57 million square feet is expected to outpace completions totaling 32 million square feet, resulting in a 30-basis point decline in vacancy to 9.4 percent and 1.3 percent effective rent growth. This entry was written by marcusmillichap, posted on October 18, 2012 at 11:20 pm, filed under Research and tagged Commercial Real Estate, Consumer Credit, Economy, Marcus and Millichap, Real Estate, research, Retail Sales. Bookmark the permalink. Follow any comments here with the RSS feed for this post. Post a comment or leave a trackback: Trackback URL. Amazing problems altogether, you recently acquired your brand completely new viewer. Just what would you advocate in terms of the post that you simply made at times during the past? Almost any good?